A dead battery is the most common reason vehicle breakdown services are needed. 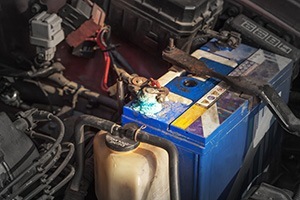 A vehicle battery can go dead for a variety of reasons, such as leaving on lights and using excessive electronic accessories before the battery is fully charged. However, it can also die for no apparent reason; that’s when you probably will need to replace it, which can be inconvenient and expensive. There are steps you can take to ensure your battery’s health and longevity. Unless you live in an extreme climate which shortens battery life, your vehicle battery should last three to five years. Follow the basic maintenance tips below to ensure your battery works for as long as possible. The terminals and clamps on a vehicle battery are especially prone to corrosion, so inspect them regularly. Corrosion build-up can cause the battery to malfunction, as electrical charge can no longer pass between the battery and the cables. If you notice corrosion around the terminals, gently scrape it off with some pliers. The casing should also be regularly inspected for cracks or other signs of damage and is usually part of any service appointment. Frequent short journeys place stress on your battery and shortens its lifespan. The alternator charges your battery when you drive the vehicle, and when you frequently drive short distances, the alternator doesn’t get time to charge the battery properly. Try to avoid short journeys whenever possible, especially in cold climates. If you don’t use your vehicle often, you’ll find your battery prone to dying, especially in colder months. Before buying a charger, you’ll need to know what sort of battery your vehicle has. If your vehicle has start-stop technology, you’ll need a smart charger. Consult with your dealership’s Service Department if you are unsure. If you are required to disconnect the battery for any reason always refer to the vehicle’s manual for the correct procedure. On the majority of vehicles, the negative terminal is disconnected first, followed by the positive terminal (vice-versa to reconnect them.) However, this can vary in some models, so check first. There may also be certain procedures required to reset on-board computers and seat positions following removal of the battery, so you will need to be familiar with the security codes. • The case looks swollen, the sides are bulging outwards, or if fluid is leaking from the battery. Don’t operate the vehicle; call your dealership for advice and replace the battery as soon as possible. When you replace the battery, ensure you dispose of it in an environmentally responsible manner; a vehicle battery is a dangerous item if disposed of in the wrong way. The best course of action is to have the dealership replace the battery for you whenever possible. Battery acid is extremely corrosive and dangerous. Vehicle batteries aren’t designed to last forever, but with some basic knowledge and maintenance you can ensure yours runs reliably for as long as possible. Developing good habits such as avoiding short journeys and turning all the electronics off before switching the engine off will reduce stress on the battery and lessen the chance of your battery going dead when you least expect it. If you’ve had your battery for a couple of years, have it checked during your next regularly scheduled maintenance check to ensure it’s still functioning as it should be.